The Saab JAS 39 Gripen (English: Griffin name: Griffin.) is a lightweight single engine multirole fighter aircraft manufactured by the Swedish aerospace company Saab. Gripen International acts as a prime contracting organisation and is responsible for marketing, selling and supporting the Gripen fighter around the world. By the late 1970s a replacement for Sweden's aging Saab 35 Draken and Saab 37 Viggen was needed. A new fighter was being considered by 1979, with design studies beginning the following year. The development of the Gripen began in 1982 with approval from Swedish Parliament. The Gripen was designed for performance, flexibility, effectiveness and survivability in air combat. The designation JAS stands for Jakt (Air-to-Air), Attack (Air-to-Surface), and Spaning (Reconnaissance), indicating that the Gripen is a multirole or swingrole fighter aircraft that can fulfill each mission type. 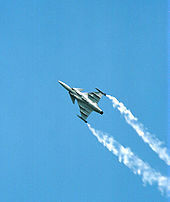 The JAS 39 received the name Gripen through a public competition in 1982. The griffin is the heraldry on Saab's logo and suited the multirole characteristics of the aircraft. Furthermore, the griffin is the symbolic animal on the coat of arms of x�stergx�tland, the province in which Saab AB is headquartered (Linkx�ping). Picture - Empire Test Pilots' School JAS 39B Gripen taxis after landing at RIAT 2008. Sweden chose to develop the Gripen rather than purchase a variant of the F-16, F/A-18A/B, or the "F-5S" version of the Northrop F-20 Tigershark. The first Gripen was rolled out on 26 April 1987, marking Saab's 50th anniversary. The first prototype first flew on 9 December 1988. The final aircraft of the 64-jet Batch 3 contract was delivered to FMV on 26 November 2008. This was accomplished at a 10% less than the agreed-upon price for the whole batch, putting the JAS 39C flyaway cost at under US$30 million. About 33% of the aircraft's content is sourced from the United States, with the other 67% split between Swedish and European suppliers. In 1995, Saab Military Aircraft and British Aerospace or BAe (now BAE Systems) formed the joint venture company Saab-BAe Gripen AB, with the goal of adapting, manufacturing, marketing and supporting Gripen internationally. The deal was to take advantage of BAe's global marketing experience. BAe also saw the Gripen as a complementary product to its existing aircraft, fitting between its Hawk light attack/trainer and the larger Tornado and Typhoon fighters. This cooperation was extended in 2001 with the formation of Gripen International for the same purpose. In December 2004, Saab and BAE Systems agreed that from January 2005 Saab would take full responsibility for marketing of the Gripen in light of Saab's increased export marketing capabilities. On 26 April 2007, Norway signed an agreement on a joint development programme of the aircraft regarding co-operation in advanced development work on future versions of the aircraft. The value of the deal, which will allow Norwegian companies to take part, is about NOK 150 million over two years. In June 2007, Thales Norway A/S and Saab signed a contract concerning the development of communications systems for the Gripen fighter. This order for the Norwegian company is the first to be awarded under the provisions of the Letter of Agreement signed by the Norwegian Ministry of Defence and Gripen International in April 2007. As part of Gripen International's marketing efforts in Denmark, a deal was signed in December 2007 with Danish technology supplier Terma A/S which allows them to participate in an industrial co-operation programme over the next 10-15 years. The total value of the programme is estimated at over DKK 10 billion, and is partly dependent on Denmark choosing the Gripen. Picture - Saab Gripen NG demonstrator at RIAT 2010. A two-seat "New Technology Demonstrator" has been built, and was presented on 23 April 2008. It has increased fuel capacity, a more powerful powerplant, increased payload capacity, upgraded avionics and other improvements. The new aircraft is also referred to as the "Gripen Demo", the "Gripen E/F", or MS21. The new Gripen NG (Next Generation) will have many new parts and will be powered by the General Electric F414G, a development of the F/A-18E/F Super Hornet's engine. The engine will produce 20% more thrust at 98 kN (22,000 lbf), enabling a supercruise speed of Mach 1.1 with air-to-air missiles. Compared to the Gripen D, the Gripen NG's max takeoff weight has increased from 14,000 to 16,000 kg (30,900-35,300 lb) with an increase in empty weight of 200 kg (440 lb). Due to relocated main landing gear, the internal fuel capacity has increased by 40%, which increase range significantly. Combat radius will be 1300 km with six AAMs + drop tanks, and 30 min on station. Ferry range will be 4,070 km (2,200 nmi) with drop tanks. The new undercarriage configuration also allows for the addition of two heavy stores pylons to the fuselage. Its PS-05/A radar adds a new AESA antenna for flight testing beginning in mid-2009. 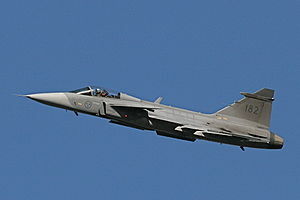 Gripen Demo's maiden flight was conducted on 27 May 2008. The test flight lasted about 30 minutes and reached a maximum altitude of about 6,400 meters (21,000 ft). On 21 January 2009, the Gripen Demo flew at Mach 1.2 without reheat to test its supercruise capability. Saab performed study work on an aircraft carrier based version in the 1990s. In 2009, Saab launched the Sea Gripen project in response to India's request for information for a aircraft carrier aircraft. Brazil also has a potential carrier aircraft need. Sweden awarded Saab a four-year contract in 2010 to improve the Gripen's radar and other equipment, and lower its operating costs. In June 2010, Saab stated that Sweden plans to order the Gripen NG under the JAS 39E/F designation. The new variant is to enter Swedish service in 2017 or possibly earlier if export orders are received. In designing the aircraft, several layouts were studied. Saab ultimately selected a canard design with relaxed stability. The canard configuration gives a high onset of pitch rate and low drag, enabling the aircraft to be faster, have longer range and carry a larger payload. The combination of delta wing and canards gives the Gripen significantly better takeoff and landing performance and flying characteristics. The totally integrated avionics make it a "programmable" aircraft. It also has a built-in electronic warfare unit, making it possible to load more ordnance onto the aircraft without losing self defence capabilities. The 300-link is used to share data between fighters. The Gripen affords more flexibility than earlier generations of combat aircraft used by Sweden, and its operating costs are about two thirds of those for JA 37 Viggen. In the Swedish Air Force's list of requirements was the ability to operate from 800 m runways. Early on in the programme, all flights from Saab's facility in Linkx�ping were flown from within a 9 m x� 800 m outline painted on the runway. Stopping distance was reduced by extending the relatively large air brakes; using the control surfaces to push the aircraft down, enabling the wheel brakes to apply more force and tilting the canards downwards, making them into large air brakes and further pushing the aircraft down. The Gripen uses the modern PS-05/A pulse-doppler X-band radar, developed by Ericsson and GEC-Marconi, and based on the latter's advanced Blue Vixen radar for the Sea Harrier (which inspired the Eurofighter's CAPTOR radar as well). The radar is capable of detecting, locating, identifying and automatically tracking multiple targets in the upper and lower spheres, on the ground and sea or in the air, in all weather conditions. It can guide four air to air missiles (e.g. AIM-120 AMRAAM, MBDA MICA) simultaneously at four different targets. On 27 March 2009, Saab and Selex Galileo signed an agreement for joint development of the Raven AESA radar based on Selex Galileo's AESA Vixen and PS-05/A. This radar will be able to scan 200 degrees, from slightly behind to the left to slightly behind to the right. On 9 September 2009, Gripen International offered the source code of their AESA radar as part of their bid for India's fighter competition. The cockpit has three full colour head down displays and digital emergency instrument presentation unique to the aircraft. The cockpit layout provides a human-machine interface that eases pilot workload substantially and increases situational awareness, but still provides substantial future growth potential. The pilot flies the aircraft by means of a centre stick and left hand throttles. The cockpit provides a display area some 30 percent larger than that available in most other fighters, with the multi-function displays taking up around 75 percent of available space. It is dominated by three large (15.7 x 21 cm) active-matrix, liquid crystal, multi-function displays and a wide angle (20 x 28 degree) head-up display (HUD). The displays are equipped with light sensors for computer assisted brightness and contrast control. One interesting feature is the Gripen's ability to take off and land on public roads, which was part of Sweden's war defence strategy. The aircraft is designed to be able to operate even if the air force does not have air superiority. During the Cold War, the Swedish Armed Forces were preparing to defend against a possible invasion from the Soviet Union. Even though the defensive strategy in principle called for an absolute defence of Swedish territory, military planners calculated that Swedish defence forces could eventually be overrun. For that reason, Sweden had military stores dispersed all over the country, in order to maintain the capacity of inflicting damage on the enemy even if military installations were lost. Accordingly, among the requirements from the Swedish Air Force was that the Gripen fighter should be able to land on public roads near military stores for quick maintenance, and take off again. As a result, the Gripen fighter can be refueled and re-armed in ten minutes by a five man mobile ground crew operating out of a truck, and then resume flying sorties. In the post-Cold War era, these dispersed operation capabilities have proved to be of great value for a different purpose. The Gripen fighter system is expeditionary in nature, and therefore well suited for peace-keeping missions worldwide, which has become the new main task of the Swedish Armed Forces. The Gripen is in operational service with the Swedish Air Force, which has ordered 204 aircraft (including 28 two-seaters). The Czech Air Force and the Hungarian Air Force also operate the Gripen, and currently lease 14 Swedish Air Force aircraft each, with the option of eventually acquiring them. In both cases two of the aircraft are two-seaters. The Czech and the Hungarian Air Force are the first Gripen operators within NATO. One of the design modifications required in order to make it NATO compatible was the ability to undertake aerial refuelling. The Gripen refuelling trials was the first time a NATO tanker had refuelled a Swedish fighter. Deliveries to the South African Air Force (26 aircraft, including nine two-seaters) commenced in April 2008, and are ongoing. As of June 2010, 15 aircraft, nine two-seater aircraft and six single-seaters have been delivered. 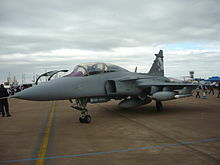 The Gripen has also been ordered by the Royal Thai Air Force (six aircraft, four of them two-seaters). The Empire Test Pilots' School (ETPS) in the United Kingdom uses the Gripen as its advanced fast jet platform for training test pilots from around the world. In October 2008, it was reported that the Brazilian Air Force had selected three finalists in their F-X2 program. They are Dassault Rafale, Boeing F/A-18E/F Super Hornet and Gripen NG. The number of aircraft involved is 36 and possibly up to 120 later. The decision was expected on 2 October 2009. On 2 February 2009, Saab submitted a tender for 36 Gripen NGs to the Brazilian Air Force Command. On 5 January 2010, it was reported in the media that the final evaluation report by the Brazilian Air Force placed the Gripen ahead of the other two contenders. The decisive factor was apparently the overall cost of the new fighters, both in terms of unit cost, and operating and maintenance costs. It appears that Brazil is likely to buy the Rafale offering, subject to the outcome of a legal challenge. The Croatian Air Force has announced plans to replace their MiG-21 bis aircraft, possibly with either the JAS 39 Gripen or the F-16 Falcon. The final projection calls for 12-18 aircraft. On 27 March 2008, the Swedish Defence Material Administration and Saab responded to Croatia's request for information regarding the procurement of 12 aircraft. Due to economic and political reasons, the Croatian Air Force is not expected to make a decision before 2010. Denmark has signed a Memorandum of Understanding between the Defence Ministers of Sweden and Denmark to evaluate the Gripen, pending Denmark's future replacement of their fleet of 48 F-16s. Denmark has also requested new variants of Gripens to be developed that will include new avionics, a larger and more powerful engine, larger payload and, most importantly, longer range. This request was the basis for the Gripen NG, which satisfies all Denmark's requirements, such as the more powerful F414G engine. On 24 March 2010, the Danish Ministry of Defence decided to postpone the decision on which fighter to buy until 2010-2014. The Gripen is a contender in the Indian MRCA competition for 126 multi-role combat aircraft. Gripen International handed over its proposal on 28 April 2008. The company is offering the Gripen IN, a version of the Gripen NG for India's tender, and has opened an office in New Delhi in order to support its efforts in the Indian market. On 4 February 2009, it was announced that Saab had partnered with the Indian Tata Group to develop a new Gripen variant to fit India's needs. The Indian Air Force was rumored to have narrowed the choices to the Eurofighter and the Rafale, implying the exit of the MiG-35, F-16IN, F/A-18E/F and Gripen. Since then the IAF has reconfirmed that all six aircraft remain in the competition. Senior IAF officers, while happy with Gripen NG's features, also highlight the Gripen NG’s downside: a high level of US electronics, weaponry, and the GE F414 engine, which combine for one-third of the entire aircraft. On 7 July 2008 Dagens Industri reported that the Netherlands announced they will evaluate Gripen NG together with four other competitors and announce the result in the end of 2008. Saab responded on 25 August 2008 to a 'Replacement Questionnaire' issued by the Dutch Ministry of Defence, offering 85 aircraft to the Royal Netherlands Air Force. The Netherlands evaluated the Gripen NG against the F-35. On 18 December 2008 media reported that the Netherlands evaluated the F-35 ahead of the Gripen NG, citing better performance and lower price. On 13 January 2009, NRC Handelsblad claimed that, according to Swedish sources, Saab has made an offer to the Dutch to deliver 85 Gripens for 4.8 billion euro, about 1 billion euro cheaper than budgeted for the F-35. This price includes training of pilots and maintenance for the next 30 years. On 17 January 2008 the Swiss Defence Material Administration invited Gripen International to submit initial bids for supplying the Gripen as a replacement for their old F-5s. Saab responded with a proposal on 2 July 2008. The exact number of aircraft has not been disclosed. Bulgaria announced that they are to replace their aging Mikoyan MiG-21s with possible 16 JAS 39C/D Gripens, or 16 used F-16s. Serbian officials are currently debating on which fighter aircraft will replace the aging MiG-21 fighters in 2010. 24 aircraft are sought and the JAS 39 Gripen is one option. Other nations that are showing interest in the Gripen include Slovakia and Oman. Perx� will purchase 24 fighters. In 1989 the Finnish Air Force began to look for a new fighter to replace its fleet of MiG-21s and Saab 35 Drakens. During 1991 and 1992, the Dassault Mirage 2000, Gripen, F-16, MiG-29 and F/A-18 Hornet were evaluated. On 6 May 1992, the Hornet was announced as the winner of the fighter competition and a total of 64 aircraft were ordered. On 18 January 2008. the Norwegian Ministry of Defence issued a Request for Binding Information (RBI) to the Swedish Defence Material Administration, who responded on 28 April 2008 with a proposal offering 48 aircraft. On 20 November 2008, the Norwegian government released a statement that they have selected the F-35 for the Royal Norwegian Air Force. Norway stated the F-35 is the only fighter candidate to meet all of its operational requirements. Saab has criticized the selection, stating that there were flaws in Norway's cost calculations for the Gripen NG. On 10 February 2009, Swedish defence minister Sten Tolgfors declared that Norway had miscalculated the deal. The offer was for 48 aircraft over 20 years, while Norway had calculated on operating 57 aircraft over 30 years, thus doubling the cost. The Swedish Ministry of Defence has several other objections to Norway's calculations. Among other things, Norway has projected the operational costs for the American F-16 on the Gripen, and has not considered Swedish experiences of Gripen's operational costs. Norway also calculated with more aircraft losses in accidents than what Sweden considers reasonable based on their operational experience of the type. According to Tolgfors, Norway's mistakes will make it harder to sell Gripen to other countries. Tolgfors said that Gripen did not meet the requirements set by the Norwegian government, though media reports claimed that those requirements were tilted in favour of the F-35. The Romanian Air Force announced they would replace their MiG-21 LanceR aircraft beginning in 2008, possibly with JAS 39 Gripen, F-16 Fighting Falcon or Eurofighter Typhoon. On 23 March 2010, the Romanian Ministry of Defence decided to purchase 24 second hand F-16s. JAS 39A Fighter version that first entered service with the Swedish Air Force in 1996. A modification program has started and 31 of these will be upgraded to C/D standard. JAS 39B Two-seat version of the A variant. This variant is 0.9 meter (2 ft 2 in) longer than the single seat version. JAS 39C NATO-compatible version of Gripen with extended capabilities in terms of armament, electronics, etc. This variant can also be refueled in flight. JAS 39D Two-seat version of the C variant. Gripen Demo A two-seat technology demonstrator for improvements slated for the Gripen NG. Gripen NG/IN (Next Generation) Proposed version with new engine (F414G), increased fuel capacity, higher payload, upgraded avionics and other improvements. The Gripen IN version is a contender for the Indian MRCA competition. Sea Gripen Proposed carrier-based version based on the NG/IN version. There were 155 Gripens in service in January 2010. Czech Republic Czech Air Force has 14 Gripens on lease, including 2 two-seaters, with all in operation as of January 2010. Hungary Hungarian Air Force has 14 Gripens on a lease-and-buy arrangement, including 2 two-seaters (C/D versions). The final three aircraft were delivered in December 2007. South Africa South African Air Force ordered 26 aircraft (down from 28), nine two-seater D-models and 17 single seat C-models. The first delivery, a two-seater, took place on 30 April 2008. The South African Air Force has nine two-seaters and six single-seaters in inventory as of June 2010. Sweden Swedish Air Force: 204 aircraft originally ordered, including 28 two-seaters (121 in service). Sweden leases 28 of the aircraft, including four two-seaters, to the Czech and Hungarian Air Forces. In 2007 the Swedish government decided that the future Swedish Air Force will deploy no more than 100 JAS 39C/D Gripen fighters. A program to upgrade 31 of the air force's JAS 39A/B fighters to JAS 39C/Ds was started. The SAF has 121 JAS 39s, including 53 JAS 39As, 10 JAS 39Bs, 45 JAS 39Cs and 13 JAS 39D in service in January 2010. Thailand The Royal Thai Air Force ordered six Gripens (four single-seat C-models and two two-seat D-models) in February 2008, with deliveries to begin in 2011. Six more Gripen Cs were ordered in November 2010. The Gripens will replace the 12 F-5B/Es at Surat Thani Airbase. United Kingdom Empire Test Pilots' School: Under the agreement, ETPS instructor pilots and students undergo simulator training with the Swedish Air Force, and go on to fly the two-seater Gripen at Saab in Linkx�ping, in two training campaigns per year (spring and autumn). The agreement was renewed in 2008. Six Gripens have crashed causing only minor injuries; one prototype, one production aircraft and four in service with the Swedish Air Force. Frawley, Gerard. The International Directory of Military Aircraft, 2002-2003. London: Aerospace Publications Pty Ltd, 2002. ISBN 1-875671-55-2. Griffiths, Dave. "AFM Evaluates the Gripen" Air Forces Monthly, No. 144, March 2000. Jackson, Paul. Jane's All the World's Aircraft 2008-2009. London: Jane's Information Group, 2009. ISBN 978-07106-28374. Lake, Jon. "Gripen C/D" (Supplement). Air International. London: Key Publishing Ltd., July 2008. Lindqvist, Gunnar and Bo Widfeldt. Rikets flygplankx�p - JAS 39 Gripen (Swedish). Nx�ssjx�, Sweden: Air Historic Research AB, 2003. ISBN 91-973892-5-0. Spick, Mike. "Saab JAS 39 Gripen". The Great Book of Modern Warplanes. St. Paul, Minnesota: MBI Publishing Company, 2000. ISBN 0-7603-0893-4. Williams, Mel, ed. Superfighters, The Next Generation of Combat Aircraft. London: AIRtime, 2003. ISBN 1-880588-53-6. Winchester, Jim, ed. "Saab JAS 39 Gripen" Modern Military Aircraft (Aviation Factfile). Rochester, Kent, UK: Grange Books plc, 2004. ISBN 1-84013-640-5.